San Francisco Landmark Signs is a sign and display maker in business since 1982. It is the only graphics shop of its type in the San Francisco Bay Area that provides full digital and analog production services as well as hand skills. Its product offerings include large format digital printing, dimensional signage, major motion picture props and CNC routing. Customers include major Hollywood studios, retailers, corporations, advertising and marketing agencies, and trade show production companies. SF Landmark Signs purchased a Trident CNC router from AXYZ in June 2015. Trident, designed especially for the digital print finishing industry and companies like SF Landmark, uses high speed knife processing and cutting with a three-head configuration. Company owner Bill Stender says the addition of the router has significantly expanded SF Landmark’s capabilities by being able to cut various types of materials that he could not cut with the smaller area router his business previously used. SF Landmarks Signs offered a diversified series of services including hand lettering, scenic painting and screen painting, but Bill Stender knew he had to offer more in the way of customer services, particularly in terms of size and media. “We were using a router that limited the cutting area to 54-inches x 54-inches, and we were unable to cut materials like cardboard, foam board and fluted polystyrene,” he recalled. Stender determined he needed a sophisticated router for more precise cutting than his current router could provide, but he had other needs as well. His decision to purchase a technologically sophisticated CNC router involved complex consideration and evaluation. “It’s always a concern when investing in a large piece of equipment and not having experience with that company,” he said. Stender was also interested in enhancing his printing and cutting capabilities. “We used to do camera registration, UV printer and router manually, which took a considerable amount of time, and we weren’t getting the precision required for this type of cutting,” he said. What he looked for was a CNC router with automated software that would match the camera registration from the UV printer and cut to specifications for a much larger size without having to manually enhance it. “We needed the bigger area if we were going to meet our customers’ requirements and grow our business,” Stender said. Stender launched his search for the right CNC router at a trade show where he investigated the offerings of eight different companies. He also researched online and paid particular attention to customer feedback. The latter was particularly important because among his requirements for selecting the right equipment and company included positive customer experiences and robust construction. 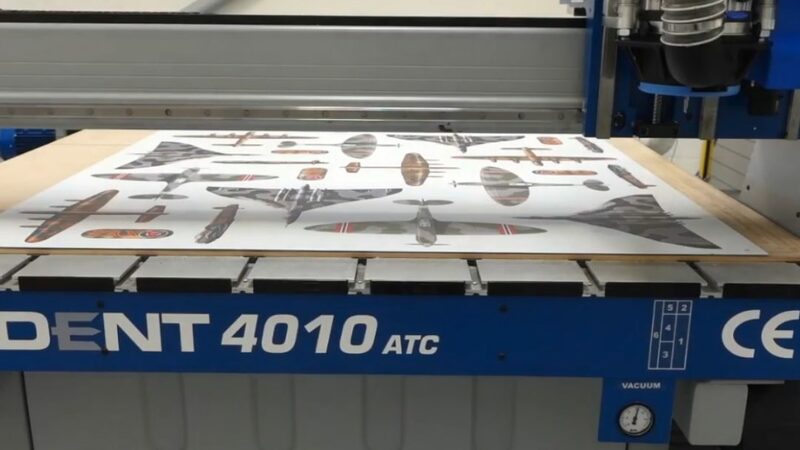 Multiple knife options were important to SF Landmark Signs since it planned to use the CNC router to expand its production services by offering a larger graphic sizes and significantly more materials than the company’s older router could cut. SF Landmark Signs purchased the AXYZ Trident CNC Router with its tangential and oscillating knives in June 2015. “It has gone very well in hindsight,” Stender said. The Trident series purchased by the company has the most versatile router-knife configurations in today’s market. It is especially designed for the digital print finishing industry in its ability to provide high speed knife processing cutting. The Trident has a three-head configuration consisting of the routing spindle, the oscillating knife and the tangential knife. It allows for cutting of thinner materials—a necessity for companies like SF Landmark Signs—but also offers a longer-stroke knife unit for blades up to 4.75-inches long to allow for cutting of thicker materials. Its maximum flexibility is evident in the ability of Trident to cut standard process areas ranging from 60-inches x 48-inches to 85-inches x 120-inches. The expanded sizes were a requirement for Stender when he reviewed Trident’s capabilities compared with other routers. Most important, Trident exactly matches the camera and UV printer registration, eliminating the previous need for manual cutting adjustments. Stender said his workforce can now produce perfectly registered panels for large walls and sets. Another advantage… Stender reported that training took “less than two days” and that his employees “couldn’t wait” to work with Trident. “We have had very few issues, and they were promptly resolved,” Stender said. The quality of the work is evident in a YouTube video that Stender posted in October 2015. “The 4 Gates of Burning Man” uses time-lapse photography to show the production of panels displayed successfully at Burning Man that same month. Since Burning Man, San Francisco Landmark Signs has been taking advantage of the larger area for cutting provided by Trident and its knife configurations, effectively eliminating the previous problem of size limitations. Stender said Trident has revolutionized his company’s ability to produce cut graphics on practically every kind of substrate. “I foresee an even greater range of products and services for our customers,” he said.